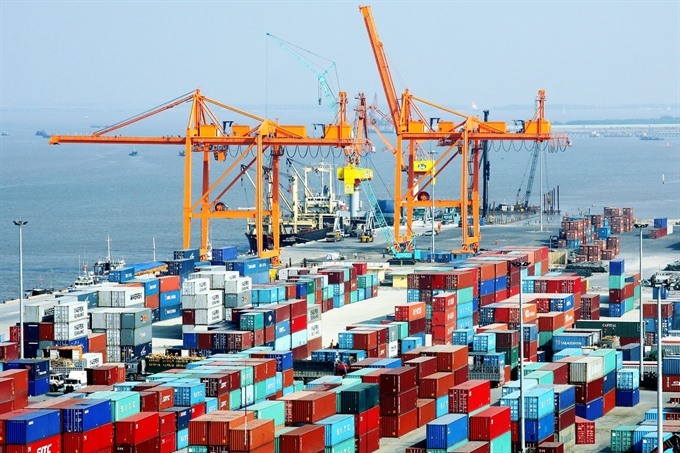 HÀ NỘI — Việt Nam continued to make a trade surplus of US$3.39 billion in the first five months of 2018, reported the General Statistics Office (GSO). The foreign direct investment (FDI) sector, including fuel, took the lead with a surplus of $13.78 billion. The country’s export turnover increased by 15.8 per cent year-on-year to $93.09 billion in the first five months, of which the domestic-invested sector reached $26.43 billion, up by 17 per cent, while the FDI sector (including fuel) earned $66.66 billion, rising by 15 per cent and occupying 71.6 per cent of the country’s total exports. Major export products posting encouraging earnings included electronics and computers worth $10.9 billion, up by 14.2 per cent; mobile phones and components, which were valued at $19.5 billion, up by 19.8 per cent; and machinery, equipment and parts amounting to $6.4 billion, up by 29.7 per cent. Others products included footwear ($6.1 billion, up by 7.9 per cent); vehicles and their components ($3.3 billion, up by 17.2 per cent); wood and wooden goods ($3.3 billion, up by 10 per cent); seafood ($3.1 billion, up by 11.1 per cent), fruits and vegetables ($1.7 billion, up by 19.6 per cent); rice ($1.6 billion, up by 51.1 per cent) and cashew ($1.4 billion, up by 25.3 per cent). Turnover declines, however, were seen in several staples such as coffee, $1.6 billion, down by 12 per cent; rubber, $630 million, down by 10.8 per cent; pepper, $379 million, down by 37.1 per cent; and crude oil, $919 million, down by 20.4 per cent, GSO said. According to GSO, the United States remained the largest export market for Việt Nam during the period, with an export turnover of $17.4 billion, increasing by nine per cent compared to the same period last year. The European Union and China ranked second and third, with $16.9 billion (up by 13.6 per cent) and $13.8 billion (up by 30.8 per cent), respectively. They were followed by ASEAN countries with $9.8 billion and Japan and the Republic of Korea with $7.2 billion each. In terms of imports, the country spent $89.7 billion to import goods from January to May, up by 8.2 per cent year-on-year. Imports accelerated due to the growth of several commodities serving the products for export, including electronics and computers worth $16.1 billion, up by 14.1 per cent; mobile phones and components worth $5.2 billion, up by 1.3 per cent; and petrol and oil worth $3.6 billion, up by 35.3 per cent.